Official Website of The Berlin Wall Freedom Expedition, November, 1989. Now YOU Can Own a Piece of True History - The Berlin Wall. The Berlin Wall Makes a Great Gift! The potent symbol of Communist tyranny became the site of celebration on November 9, 1989, as the wall opened for the first time since 1961. Freedom wins! View the photos of this historic occasion as witnessed by four American adventurers who joined East Germans in their introduction to freedom and who helped tear down the Wall. Read the adventures of The Berlin Wall Freedom Expedition. Post your stories from this historic period. 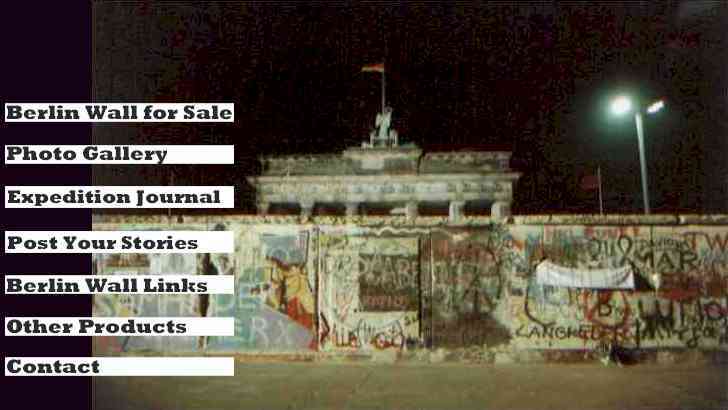 Buy a piece of the Berlin Wall as a symbol of the end of the Cold War and the triumph of freedom. Would you like to volunteer to translate this website into other languages? www.Berlin-Wall.Net "Berlin dash Wall dot Net"
For the 28th anniversary year of the Fall of the Wall, media are invited to contact me for an interview. Suggested topics: What lessons does the fall of the Wall have for today's world events? What was it like in Berlin and Leipzig during those exciting & historic times? How did East Germans react to freedom and what did they do when they first crossed the Wall? Any questions about smashing down the Wall (how did you smash down 1000 lbs/500kg of Wall? ); transporting it across the ocean, selling it at that time and today; who buys pieces of the Wall and why. Why we went to Berlin. Compare Berlin and the Wall from my first visit in 1975 to the 1989 and later visits. What was it like through the eyes of Americans? Or any topic regarding the Wall, its history, Communism, freedom and society, other adventures behind the Iron Curtain, or you name it! One who was there can add important color to your story.